If you can’t understand the Geeks Toy by the end of this post, I’m the dummy. Many readers have been asking for years, literally… I’ve finally got off my arse to explain. If you struggle to understand the trading software it’s probably best to bookmark this post now, it’s absolutely rammed with links, content and references to answer just about every question you could have when it comes to the Geeks Toy trading software for Betfair (or Betdaq). If you want to succeed on Betfair, you need trading software. Why? Speed – It’s an advantage, if you can place a bet faster than a website user there’s an advantage. Live Information – A Geeks Toy refreshes at 200 milliseconds. Everything is LIVE, unlike the Betfair website where you’ll be clicking refresh constantly (and still be behind). Charting & Graphs – There’s a whole load of extra features, assisting the user in making an informed decision. And of course they’re live. Position Calculation – You don’t need to alter stakes constantly or ‘do the math’ everything’s calculated for you, so you know your exact financial position all the time. I’ve always used the Geeks Toy from day one, it’s worked out great and there’s rarely been a problem. There are others available, although I tend to think they carry lots of bells and whistles you don’t necessarily need. 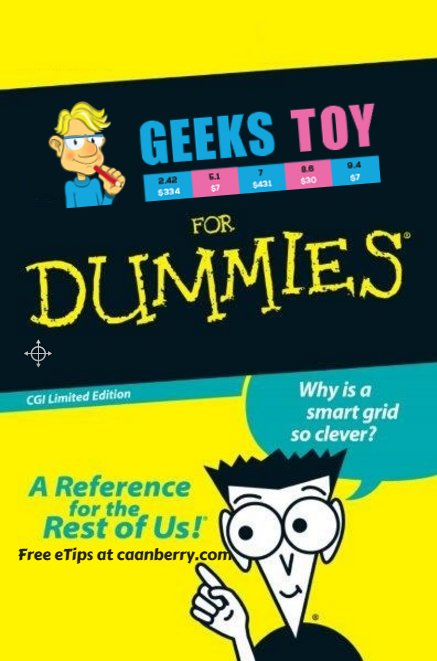 The Geeks Toy is one of the cheapest too at £20 for 3 months. New users get a free trial. The ladder interface is where I live, It’s where I place all my trades. Without it I’d be lost. Below is a screenshot of the ladder interface, complete with Market Navigator and Market Overview Chart (more about them later). Market Navigator – The main control centre for the Geeks Toy if you like. Market Overview – Streaming chart, plotting the different outcomes against each-other. More on that in a moment. ‘Ladder’ x 4 – Each one is identical, they just represent different outcomes. The top right box is your selected stake, or bet (£10 in this case). Below is the selected ladders ‘outcome’ or ‘selection’ if you like. Next to it’s colours, assuming you’re trading a horse race. (Gilzean is the horse here). 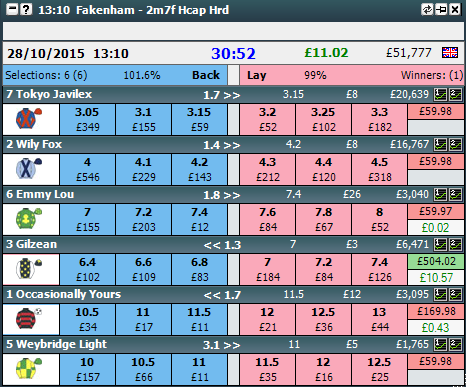 The green figure is the potential payout if the bet was to win the entire race (£504.02 here). The blue S means the type of staking plan selected is on ‘stake’ I’d advise this, there are other options but they are mostly un-used (see the Geeks Toy manual if needs be). Below that; if you have it activated, is the horses Jockey (left) and trainer (right). All very straight forward, right? Now, it depends on your personal preference but I have the ‘Streaming Charts’ activated at the top of ladder here (more explanation soon). In this instance it’s the traded volume chart, over 10 seconds. Why? Because I like to see if any extremely large bets fall into the market while I’m trading, in the moment. Below that are your stake buttons (Blue), it just makes for easier stake/bet selection. Below this is the total sum column, you can see a 1.5 in the image. These are generally of no use to us. They’re an indicator as to the ‘weight of unmatched money’ but if I was to place a very large bet in the market, it would skew these numbers… hence it’s no real use. To the right though, can be helpful. I’m talking about the 7.1k. This is the total volume matched on this specific ladder (the sum of all the little grey numbers below). From there on below, it’s pretty much the same in each row. Just to make it crystal clear I shall explain the row at 7.8. You can’t see the 7.8 of course, because there is a blue 20 in it’s place, this is one of my bets. Where as; at 8.0 I don’t have any bets waiting to be matched. Starting at the very left, you can see the blue lines below have moved down from this price, this is where the price previously was. To the right of that area we have a light pink cell with nothing in it, that’s because there is no lay money available at this price (the current price is lower). Covering the 7.8 cell is a blue 20, as previously mentioned, one of my bets. The column in the centre, expressing the numbers as decimal is the price column (or your current unmatched bets). To the right of the price column is the back column, you’ll see a 60 there. This is because there is £60 ‘available’ to lay against (somebody elses back bets), of that £60, £20 is mine. This money is unlikely to be matched soon as the price is now lower than before, when the bet was previously placed. To the right of the blue column is the traded volume column, in this case £258 was matched at that price. And finally to the right once more is our Profit or Loss column. The Geeks Toy software calculates our potential profit or loss at the prices in line with this figure. This figure is hedged up across the entire event or race. So, bearing in mind there is an open trading position in the image to the left; we could currently ‘hedge’ at 6.6 for £15.45. If the price should move back against us to 7.2 we could only hedge for £8.33. Make sense? I should have told you this at the start; but looking at a ladder in the Geeks Toy is like looking at the Betfair website (ish) if you put your left ear on the desk now. Ok, below all the prices you’ll see two boxes. On the left; unmatched bets (currently at 9.0 and 9.2 – check in the price column, see them?) and on the right hand box at the bottom is the matched bets (7.6 for £50 and 9.2 for £20). If I hadn’t opened a position for this example the profit and loss column would be empty (like the others ladders on the initial screenshot at the top of this post!). And finally, the very bottom of my ladder is the Betfair graph. It’s the same as the ones available on Betfairs website, although I like to see them all at once. In relation to the other outcomes it can be quite helpful at times. Although not always. Phew, that was pretty long winded. Hopefully you’re still awake! To adjust just about anything ladder related you’ll need to right click on the actual ladders header-bar. The Geeks Toy manual gives a short cut to most of the menus if you can’t find something. The main ones I’ll talk about a bit below. The Geeks Toy grid is the interface most like the Betfair website itself. The number one difference being, one-click betting. The numbers are displayed in the same format, which saves you putting your head on the desk. With the countdown to the start in the centre at the top, possible hedge figure in green (or red if you’ve got it wrong) and total traded volume to the right. Unlike the ladder, each selection, its colours and available money is listed from left to right. The little icons 1 and 2 are short-cuts to charting and the figures below them are the current exposure or payout (see the green £504.02 much like the ladder above?). To be honest I don’t use the grid. I’m sure it’s useful in some situations, depending on the sport or event you’re trading but for the racing I don’t use it. If you’re monitoring 5 or so tennis matches at once I can see it’s use. Other than that, I’m yet to find one of great benefit. It’s not ideal for trading the horse-racing in my eyes as there is less information available to the user. And it doesn’t look quite so clear. The Geeks Toy evolves around the Market Navigator. It’s pretty much the main menu. Horse Racing > GB > Newb 13th May > 14:00 (this is the win market). Alternatively, for a ‘quick pick’ you can right click on the Market Navigators header bar and select from the up-and-coming horse races. The difference being you won’t be able to see races that take place considerably later in this menu. The Market Overview is one of my favourite charts in the Geeks Toy, just because it’s so clear and allows you gauge the various options against each-other. There’s not a lot to say other than keep things simple! 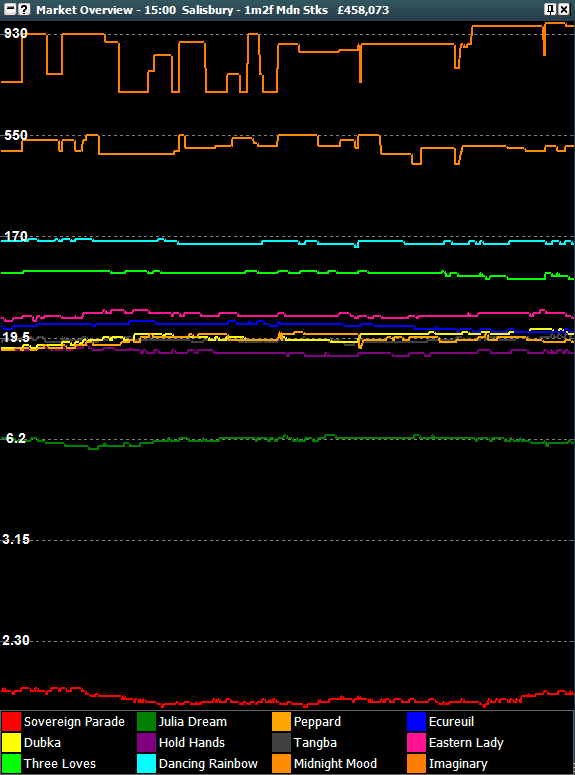 The chart streams from right to left, updating at a pre-determined refresh rate, over a range you choose. To select a different refresh, range or even play about with the colours just right click on the chart once it’s open. You can select the market overview chart via the Geeks Toy market navigator, just right-click on the header. 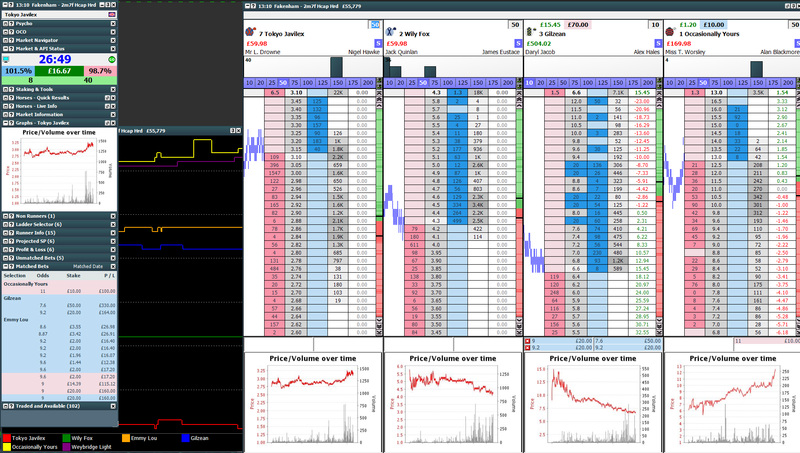 Betfair graphs are a little more complicated and require their own post. It’s down to personal preference, sport, market type, trading time, style and many other things as to what will benefit you most. What works really well in one situation will be near on useless in another. I’d suggest tailoring your setup to what you need, one of the main reasons I favour the Geeks Toy over other software’s. Much like the Market Overview you can change the ranges and refresh rates or chart type by right clicking on them once open. You can enable streaming charts by right-clicking the Ladder or Grid interface once open. You can find out more about setup via the YouTube Channel Help Playlist. If you’ve never set up a Geeks Toy profile before the YouTube videos at the bottom of this post will help. It’s important to remember your specific needs when creating a profile. One of the reasons the Geeks Toy is my preferred software is the customizability it offers. For example if you’re trading a horse race in-play, the markets tend to bounce around here there and everywhere. They aren’t very liquid and prices can move from 100 into 1.01 within a matter of seconds. 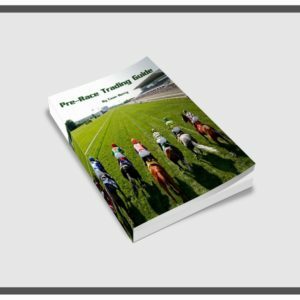 Trading from home puts you behind the track-side punters so you’ll need to set up the software in such a way you can react as quick as possible. With crazy swings and things changing fast in-play it’s ideal to have maybe 6 or 7 ladders open with the full market depth on offer (to save you scrolling up and down the ladder). You might want prices from 50.0 to 2.00 visible so you can click in an instant. Pre-Race Geeks Toy Setup (Horse Racing). In-play Geeks Toy Setup (Horse Racing). Cost – When I first started on Betfair the Geeks Toy was free. And it has been for a few periods of time over the years too. I was pretty broke at the time so it made sense to test the water with a software that didn’t cost me the earth. However, that’s much the same now with it being one of the cheapest on the market. Also you can gain a free trial from the Geeks Toy website if you’re in the position I once was. Customizability – After testing the markets for a couple of weeks it quickly become apparent to me that having the option to customize just about everything, in terms of time frames and screen layout/space was a big deal. As you can see from the examples above, it’s important. So although finding it first was a bit of a fluke I knew the Geeks Toy would be superior for me from a manual trading angle. If you’re into automation though, you may want to look at some others. Helpful Community – Like many others I posted some pretty daft questions early on, its part of being human I guess. But the users on the forum were always helpful and didn’t seem quite so ‘clicky’ as elsewhere. As I do now, there were even some that went out of their way just to help me out with getting set up, the geek included. A question on the forum is usually answered promptly. If there’s anything not covered in this post, or the FAQ below the Geeks Toy Forum is a good place to post your question. How do I activate Geeks Toy one-click betting? One-click betting is set to off when opening the software initially. You’ll need to right click the market navigator and select confirm bets > safety > off. How do I activate keyboard short-cuts? Set your hot-keys by right-click market navigator > show/hide > short-cut key manager. Turn on short-cuts – right-click the ladder > options > keyboard short-cuts > on. Colours are easily changed within the Geeks Toy; all you need to do is open the market navigator > right-click colour schemes > edit colours. From here you can change each individual colour for your profile. Be sure to save the profile after! How do I change the sound alerts? In order to change the sound alerts you will need to insert your custom sounds under file paths found by right-click market navigator > show/hide > audio alerts. Failing that you can just turn them off if you prefer. 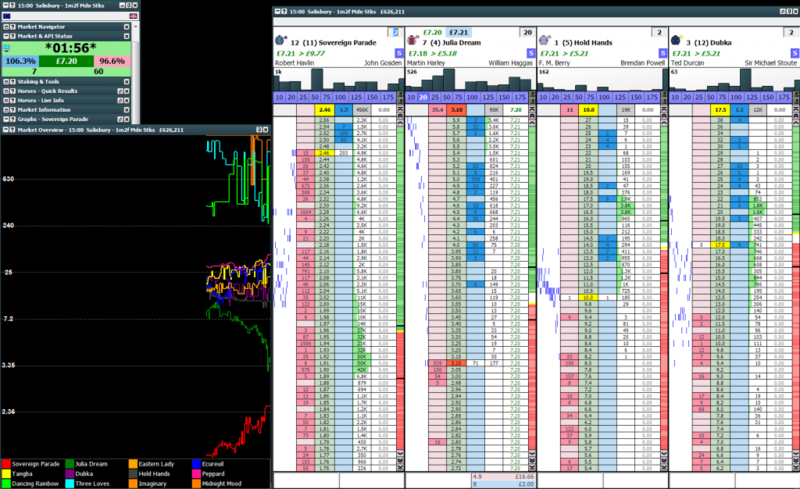 Thanks for the Geeks Toy guide Caan…..trading software always looked so bloody complicated for me to use and work it…..your explanation has certainly help me clear up a few things in my mind….and can now see the value it brings to your trading. Will now be able to watch a few videos on it and get a feel for it …. Ps….not feeling like a dummy any more !!!! No problems at all James. Glad it hit the right spot. Thanks Caan, trading software can be very tricky to explain sometimes but I think you’ve nailed it mate! Does this software only work on BetFair? Could you highlight the differences with BetAngel? Hi Tano, this software works on Betfair, Betdaq and Matchbook. BetAngel is similar although doesn’t do Matchbook as well… differences wise is mainly the cost and some extra things with BA that I don’t use. Thanks Caan, this is so helpful. I subscribed to Geeks Toy when my free trial ended, but now I’ve done something and can’t get back to the default screen. Is there a simple way to get back to the default screen it arrived with, so I can start again working through the manual. (I managed OK with the free trial, just screwed up on the paid version) Hope this makes sense. Hi Pam, if you want to get your default profile back. Right click the ladder header and there is an option for default profile. Hi Caan , What an awesome post , I was floundering a wee bit with certain aspects of Geeks Toy before I’d read this (despite reading the manual first !) but your clear explanation of everything made it all make perfect sense! Same goes for all your videos – your well thought out explanations of trading strategies and techniques you use and your advice on trading mentality and mindset have all been invaluable – without your help I wouldn’t have understood the first thing about trading and I wouldn’t be making a penny – Can’t thank you enough , mate ! keep up the good work- you are an excellent teacher. Thanks so much for having the patience to pass on the benefit of all your wisdom to us floundering, fledgling traders 🙂 – cheers , Richie. Pretty good stuff, but after installing the software I set about customising it but worried that the right hand colon is missing on the ladder and when going to place my first trade nothing happens when I click. I’m in Spain, my Betfair works fine with the VPN. I can place an order on betfair and see it on Geeks Toy but I can’t place anything on Geeks toy. I’ve tried uninstalling and reinstalling twice. I’ve forwarded this on to the geekstoy guys for you. It’s the Spanish exchange. They do not allow it. hey Caan ! I’ve been watching your video tutorials and I’ve been following your trades too. Amazing! I’ve noticed once you placed 2 bets of £50 on particular price say at 4.0 and you decided to cancel one £50 bet you can easily do so. but how do you do it? I’ve been trying to search all that it is in geekstoy settings but no avail. You have to place the counter-bet, for example if you backed twice, lay once. Do you have a video explaining the bet process. Why only lay once to cancel 2 bets or are you just cancelling the one bet. Presumably you cancel the bet with the same lay stake. Also how do you green up? Great explanation above BTW. As you can see by the questions I am still in Dummy stage. Am glad I stumbled across this page. All written in layman’s terms for potential newbies such as myself. I remember you saying in one of your YouTube videos that trading isn’t for everyone for various reasons, one such reason being that some people just wont have the basic aptitude and mental agility to be able to trade successfully, no matter how much the software helps. It is only in this area that I doubt myself right now as I never have been the sharpest ‘tool in the box’. However Caan, seeing the way you so successfully operate your own business outfit, I am massively impressed and intrigued with the whole methodology to do with horse racing price trading as a whole and am determined one day to give it a try as and when I am able to set some money aside to enable myself a fair crack at it. Anyway Caan, thanks for taking the time to explain things here and on your YouTube channel…for the time being I’m just going to read, watch and try to absorb as much as I can whilst carrying on nicking a few quid most days on my in-play footie bets. Sounds wise, Rob. Thanks for the feedback. Some may not have the aptitude for sure, but I think many underestimate how much they can change and improve. I put myself in that bracket, after all – I started life in McDonalds and with nothing but time…. I used much of it to read and learn, which is why I’m here now. Firstly, I have to thank you for all the written articles and videos made in regards to trading on the exchanges. I have read and watched all of yours and Peter Webb’s output over the course of four weeks, and probably understood 90%. Now with winter looming opportunities are fairly limited from my betting activities point so I decided to get into Trading. I am no newcomer to racing and understand that studying is all part of pre-trading after all some horses do have their quirky ways, some more so than others and it is up to us to spot and make notes of these and make use of them. This week I begun to trade using Geeks Toy on BF, but just for small stakes I have made a few errors but in the cold light of day they were happy accidents as they will not be repeated and have not affected my mind-set. This brings me onto one issue that I seem to be having. Yesterday, Friday I placed an investment on a particular runner that in my view would be the winner of a certain event and I had decided to maximise my profits by during the lead up period to post time I would trade the second and third favs, providing the market prices were favourable to make trades. Investment placed, traded done and now they are off. It was fairly clear as to who was going to contest the last 2 furlongs and who the probable winner was going to be, but of course one is never 100% certain so I decided to green up for quite a sum of money, in fact 90% of what would have been won. So I waited until it was well into the green then pressed the button at the top where it turns white once it is greened up and retracted my finger, then to my absolute horror it turned red and then white. It was well into the green when I pressed the button and I am at a loss as to how it turned red during that time? From all I have read it was my understanding that it was the right button to press if greening up was intended. After this I scoured the whole settings sections for a simple way to green up, but alas I am unable to find such a link/button. In hindsight I should not have tried to green up as I remained certain that the horse I had placed my original investment on was still going to win, it did. Hello Sir can I trade with my phone as I do not have a laptop. I really want to create another source income to fund my dream farm in Nigeria. 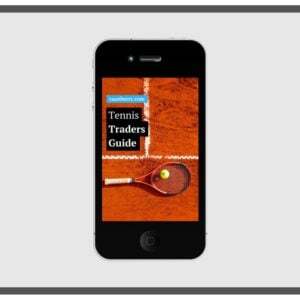 Again can you be my mentor as I am a novice in sports trading. Please I await your response. Thank you Sir. I’m not too sure. I don’t think so – however, if you contact them direct they may be able to cater to different needs I don’t know. I have been trying all day to join Geeks Toy. I can log into the forum and that is about it. I can find no place where I can enter my Betfair details to get the two systems linked. You just log in with them… they don’t get to see them as it’s encrypted on the way to Betfair. 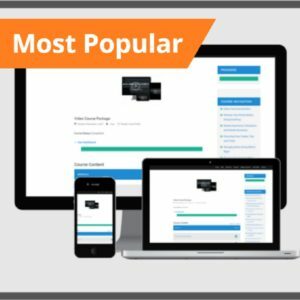 Would your video course be suitable for someone who is deaf?